It’s been over a month since we adopted a 7 month old hedgehog for Braden, our 8 year old, that he named Sonic. Braden came up to me, all on his own accord, and asked if he could buy a small pet if he saved up enough money, since a couple of his friends have hamsters. I told him I would think about it, do some research, and talk to his dad about it. I told him there was no way I was going to allow him to have a rodent as a pet, so hamsters and mice were off the table. I didn’t want anything as big as a rabbit or a guinea pig, so I narrowed it down to hedgehog or turtle. 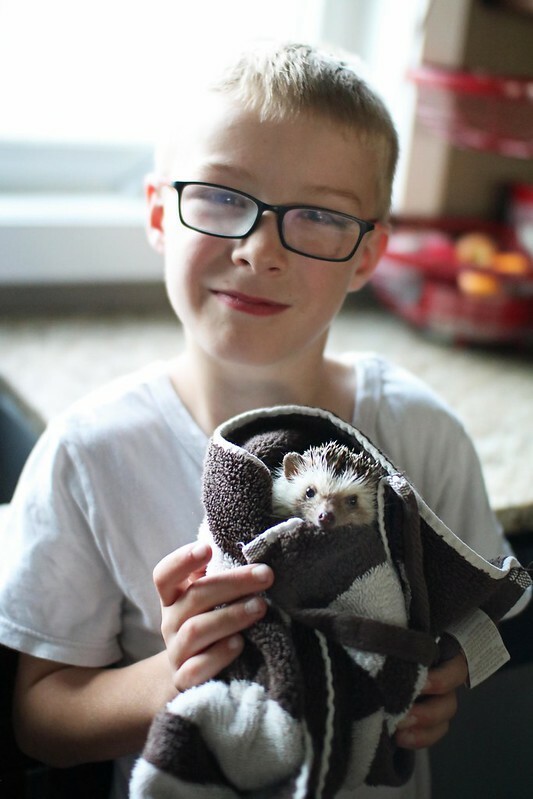 I ultimately didn’t want the hassle and smell of dealing with an aquarium, so in the end, I decided on a hedgehog, and I’d love to share with you what we have learned and what we know about our little guy. Starting with the very basics, hedgehogs are not rodents, they are mammals, nor are they related to porcupines. They don’t have quills, they are called spines, and they do not release from the hedgehog in defense like a porcupines’s quills. They are very solitary animals and it is not recommended to house them together, other than the rare occasion that females get along, or a mother/daughter/sister pair are housed together. The kind that have been domesticated, are African pygmy hedgehogs, and if well-kept care of, they can leave 4-7 years or beyond. Since they do come from a warm climate, you do need to keep them between 22ºC – 26ºC (72ºF – 80ºF); more on that later. They are also nocturnal animals, meaning they sleep all day and are awake all night. Where Do You Get Hedgehogs? We live in Canada, so I just Googled “pet hedgehogs” and Kijiji ads came up. There were no hedgehogs that needed adoption at our local humane society, so I started looked at the ads I saw. In hindsight, I should have asked more questions from the lady I bought Sonic from. She said her son bred hedgehogs and this was his last litter of hoglets, as he was running out of time to care for them. Knowing what I do now, I wish I would have asked about his lineage—if his mom/dad have any health issues or any of his older siblings have had health issues. I’m happy that we adopted him on the young side, but also not too young in the baby stage. I encourage you to do a lot of research about good breeders to get hedgehogs from in your area. Also, be sure to check if it’s legal to own a hedgehog where you live! From what I’ve seen in our area, you can expect to pay $100-$200 to purchase your hedgehog, unless someone wants to give them to you for free. What Do You Need to Own a Hedgehog? Hedgehogs need a cage with a solid bottom and at least 4 square feet of space, or 24″ by 24″. Everywhere I’ve read says to buy the same size cage as you would for a guinea pig and this Midwest cage comes highly recommended. This cage is bigger than the one I bought, and quite frankly is too big for what I’d like. I got ours second hand from a local garage sale site and Sonic seems happy and content in his cage. Hedgehogs need quite a bit of space, but they don’t like open spaces, they like their homes cluttered, so be sure to fill it with lots of toys and hideaways. I have seen some people make their own cages from clear storage bins, but make sure you do it safely, the living area should be well ventilated and need to be able to accommodate a heat lamp. Our hedgehog was raised on fluffy paper bedding and we were given 1/2 a bag when we adopted him and a full bag came with the cage I purchased for him too. There are a lot of bedding options for hedgehogs, which I’m not going to go over, but they can be susceptible to respiratory issues, so you cannot use cedar shavings, saw dust and hay/straw—be diligent in knowing what you can’t use. The alternative to disposable bedding, is to use fleece bedding that you can spot clean and wash. I used an absorbent pad with a piece of fleece over it one week to see how I liked it, and I hated it. I didn’t like to spot clean his poop every day and I found that the odor was far more noticeable with fleece than with the paper bedding. The choice is 100% up to you, some love fleece and some hate it. If you do use fleece, make sure you provide a dig box full of fleece fabric strips so that they can burrow. We spot clean the paper bedding as necessary, but it is generally recommended to do a thorough clean of the cage every week. 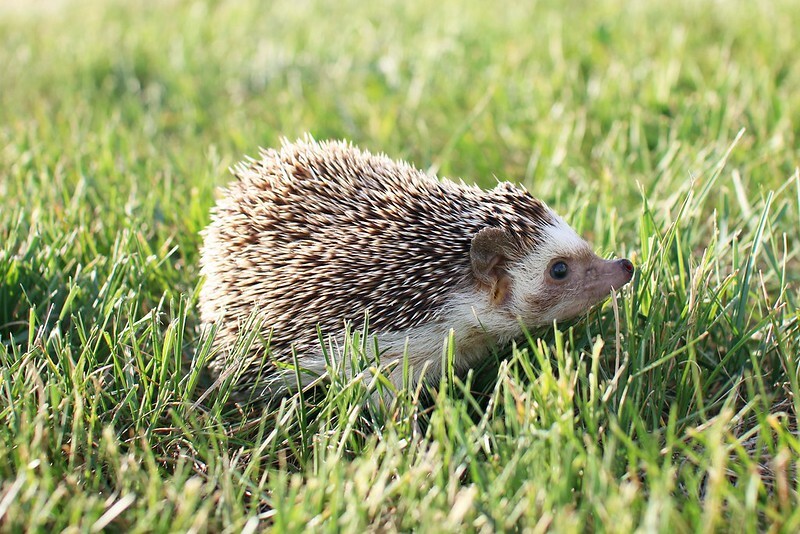 It is said that hedgehogs run up to 8 km or more per night! They need a means to burn off their energy, they love to run, so it is essential to provide them with a wheel. I love our Kaytee brand silent spinner. They say that there is no such thing as a “silent” wheel, but with this wheel all we can hear is the pitter patter of his feet while he’s running, we’ve been very happy with this option. It can mount to a wire cage or you can use the stand it comes with. There are also homemade wheels on Etsy that come highly recommended, but they are more pricey, and with that in mind plus shipping to Canada, I opted to buy the wheel we have from a local pet store. There are also flying saucer wheels, but they take up a lot of horizontal space and can fling poop across the cage and room, as hedgehogs naturally defecate when they run. Whatever you buy and wherever you buy it, make sure that it has a solid bottom, hedgehogs cannot run on wire wheels like other small animals, they’ll hurt their feet. They also need the 12″ size, the same size they market for chinchillas. This list is highly regarded in the hedgehog community as a good, comprehensive list of premium foods to feed your hedgehog. I honestly don’t recognize any of the brands sold in Canada other than Kirkland at Costco. Our hedgehog was adopted with Purina Indoor Cat formula kibble, so I’ve kept him on that and added a Purina ONE formula too; next time I’m at Costco I’ll look for the Kirkland brand they recommend. Everywhere I’ve read says do not buy food specifically labelled for hedgehogs, as backwards as that sounds; stick with cat food. I also buy him canned mealworms and he LOVES them. One day I plan to buy some live mealworms from our local pet store, but I haven’t quite gotten to it yet. You need ceramic food dishes so they are heavy enough for the hedgehog to not tip over, I love these ones! 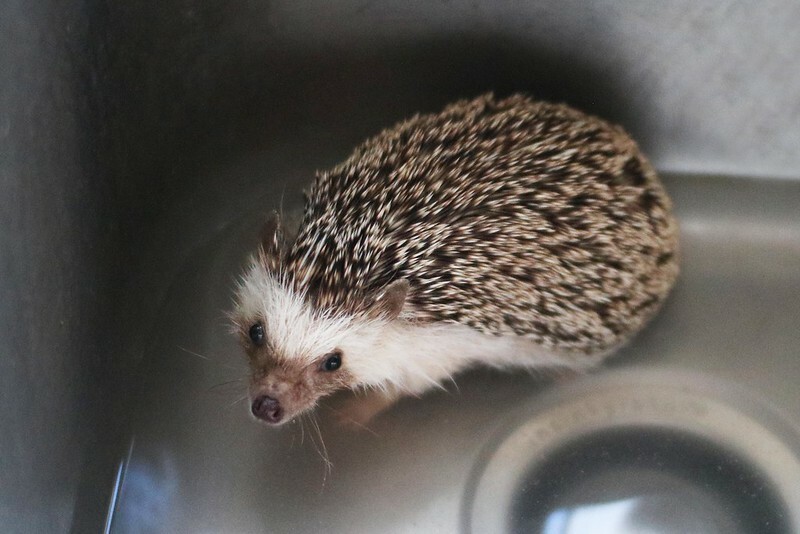 You can also use these dishes for water, but know that hedgehogs are very messy and if you have disposable bedding, it will get in the water dish and you’ll have to likely give fresh water daily, which isn’t a bad thing. To save on some space in his cage, I have chosen to use a glass water bottle which I like very much and so does he. To be completely honest, when we brought Sonic home, I thought that I didn’t need to provide him with an external heat source. I figured that since our house is heated, the hedgehog should be just fine. He lives in the big boys’ room, and that’s the coolest room upstairs, so I did bring a space heater up to turn on when we had our air conditioner running. Then I started watching more videos (I’m a very visual learner) on hedgehog heating, and realized how essential it is to their well-being to be provided with safe and proper heating options. I bought him a ceramic heat emitter dome (8.5″-10″) with infared ceramic heat emitter bulbs (100w – 150w) so as to not provide him with extra light at nighttime. Silly me, I also thought I could get away with just a thermometer and a heat lamp…but this also made my anxiety run high checking the thermometer multiple times daily making sure I didn’t fry or freeze Sonic. Take it from me—make sure you have the CHE dome, bulb and thermostat when you bring your hedgehog home for peace of mind. I got this Inkbird one, as it was limited what was available to me online in Canada, and I am very happy with it. It plugs right into the wall and is easy to set up and control. Many hedgehog owners recommend this one too. I do have a digital thermometer probe, though I can honestly say I’m not sure why it is needed, as my thermostat has a thermometer probe as well, but the experts tell me I need it, so I have it. My thermometer and thermostat are regularly about 2ºC off from each other, so I just pick the number in between and keep him in the warm range! If you’re wanting a digital thermometer, be sure to grab this one. Hedgehogs are burrowers and need a place(s) to hide to sleep. I have found Sonic loves his sheepskin tunnel the most, and I am wanting to get him a fleece snuggle sack too, but they run on the more expensive side and are sold on Etsy. We do have a straw hut for him, and his cage came with a log hideout that he loves, but it isn’t recommended to have either of these materials as they cannot properly be cleaned. I haven’t seen evidence of him urinating or pooping in his hideouts, so I can’t honestly give a reason why I’d have to clean them. These igloos are a popular hideaway for hedgies. Bet you didn’t know that you need to give your hedgehog a bath, did you? If you did, good on you…this one surprised me! They are actually very messy little things, as they defecate and urinate while they run on their wheel, and then their feet and bellies can get dirty too. You can use special hedgehog soap, or you can just go to any grocery store or drug store and buy Aveeno baby oatmeal wash, like I do; you also need a soft toothbrush to wash their spines. Do not use anything labelled as shampoo, or you can dry out your hedgie’s skin. I had an extra pair of baby nail clippers and they work just great to clip Sonic’s nails. They need to be trimmed or they can curl under and grow into their feet. Ouch! These items are on the secondary purchase list. Save up for when you have some extra money to spend on your hedgehog, other things can do in a bind. I love our little pet carrier. It was extremely affordable at only $15 and I used it to transport Sonic to school for show and tell! It’s just big enough for some bedding and a hideaway. Good to be able to take your hedgehog to the vet or anywhere else you may need to go. A small plastic bin with ventalation would work well as an alternate. My mom wanted to gift Braden with something for his new hedgehog, so I suggested this cuddle carry bag. It’s a great way to bond with your hedgehog, especially for kids. It seems like a tight fit for a hedgehog, but once they get in and curl up, it’s perfect! I recently bought a playpen for Sonic for when we travel. So far when we’ve gone outside he has been skittish and sticks close to us, so I’m not worried that he will be running away at this point. However, it is my goal to take him with us on our summer vacation, and this playpen will be very easy to transport and to use as a temporary cage for him. I really like to immerse myself in learning about new things in my life, and these resources have been wonderful in learning about hedgehogs. I am, by no means, an expert, but I’m learning a ton and I am confident that my knowledge of hedgehogs is enough to provide our Sonic with a healthy and happy life! There is a saying I’ve come across over and over again in the hedgie community which is “if you can’t afford a vet, don’t get the pet”. Hedgehogs are an exotic animal, which requires a specialized exotic vet, which can cost a lot of money. I am very lucky that in our smaller town, there is a vet who will see our hedgehog, as recommended by a friend in the area who has had hedgehogs for years. Otherwise, we’d have a 2 hour round trip to the city to see a vet. I don’t think hedgehogs would be an appropriate pet for anyone younger than 8 years of age. They are quite big to handle for small hands and it takes some bravery to bond and be able to handle these little animals at first. Braden is almost 8.5 years old and he has done very well in caring for his hedgehog, but I’ll be honest and say I do the brunt of the work. I bathe Sonic and clip his nails, at this stage I am the one who cleans his wheel on a weekly basis. Braden feeds Sonic and spot cleans his cage, dumps out the bedding as needed and adds more. 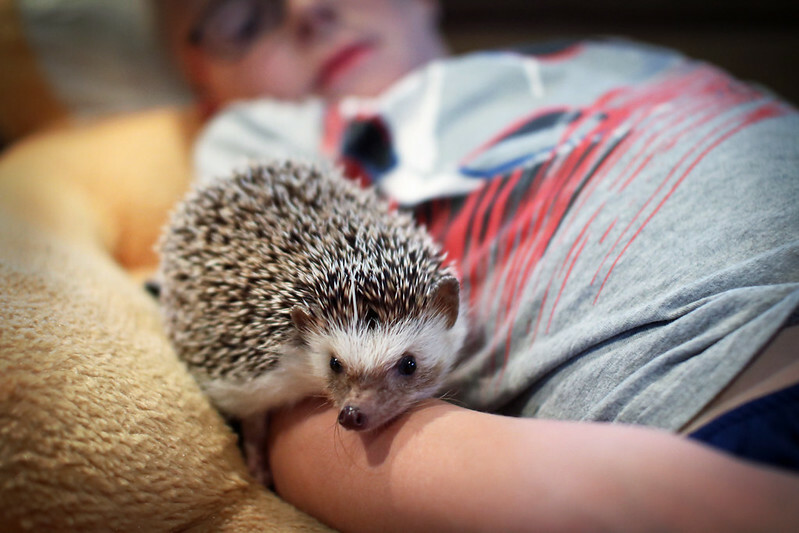 A hedgehog is not an appropriate pet for a child unless you are willing to do most of the work and take the time to bond with them and help your child learn. The start up costs are quite high, but maintenance for a healthy hedgie is very affordable! 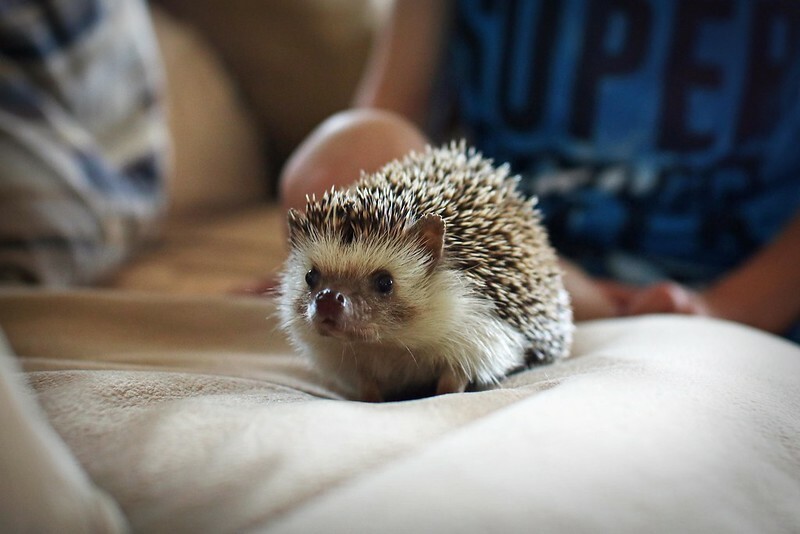 Remember, they are nocturnal, so your children won’t get to see or spend too much time with your hedgehog. If you have any questions, or are a seasoned hedgehog owner and see any misinformation or have information I should add, please let me know! Disclosure, as always, is that I am not an expert or a vet, so please seek expert medical attention if you have concerns about your hedgehog.